Want to cook once and eat twice—or more? This easy veggie dish uses sweet corn, colorful bell peppers, onions and nutty, smoky-tasting cumin in a versatile combo that is great as a dinner side and can be used for lunch later in the week in a wrap sandwich or salad. Preheat large skillet on medium-high heat. Add oil, onions and peppers and cook until peppers soften and onions begin to brown. 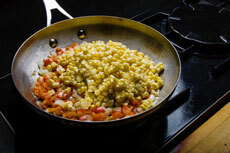 Add corn, salt, pepper and cumin and cook until corn is heated through and other vegetables are nicely caramelized. Serve as a side with grilled or broiled chicken breast or salmon. Top salad greens with this mixture and a chopped hard-cooked egg for a flavorful salad. Mix with cooked, chopped chicken breast and wrap in tortillas for an easy lunch.